10. in the first row, detached chain stitches and fly stitches are worked in between, half buttonhole wheel. Quarter buttonhole wheel are worked in two colours in the second row. 11. quarter buttonhole wheels in opposite directions form the first row. Half buttonhole wheels combined with buttonhole stitch in the second row. 12.the first row is with feather stitch combination and the second row, with individual herringbone stitches. 13. in the first row, the buttonhole stitch is worked in trianglular shape with individual cretan stitch. [not satisfied with this row]. This variation of half wheels is totally copied from Sharon’s blog. The third row, quarter buttonhole wheels are worked in between half closed feather stitch. Today I tried a few more samples of this buttonhole ’wheel’ stitch. 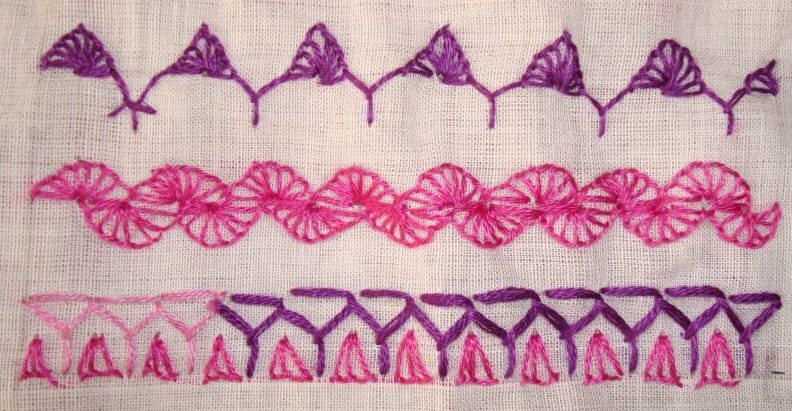 Still not getting any inspiration for this stitch variations. Continuing to work on different shapes. 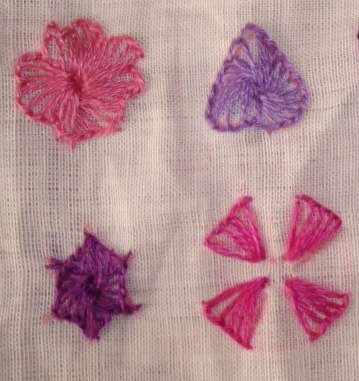 At the end of the day, my buttonhole wheel stitch sampler looks like this. 3. four shapes worked in buttonhole. 4.another set of shapes in buttonhole. 5- for the last shape , I added some detached chain stitches in the corners. 6.the first row , buttonhole wheel worked with running stitch. the second row, quarter buttonhole with zigzag back stitch. 7. diamond shapes and quarter buttonhole worked in this row. 8. buttonhole wheel worked with stem stitch and back stitch. 9. straight stitches are worked around the buttonhole wheel in the first , the outline of the wheel is worked with detached buttonhole. 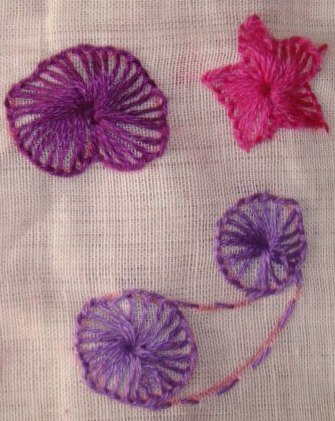 The second one in the row, with back stitch outline, the third is worked with fly stitches, the fourth one, worked with detached chain stitches. will I get inspired to work more samples? Last week was catch up week on TAST stitch challenge. I did not do any challenge related stitches at all. Therefore, was looking forward to this week’s stitch and it is buttonhole wheel. I think I have not done this stitch during the previous TAST challenge. Liking this week’s stitch does not automatically produce many ideas. The first idea is to work this on different shapes, that takes away the ‘wheel’ part of this stitch! 1.This stitch worked four shapes. I used two strands of cotton skein. The top part[third] hexagon shape is first done in four strands and bottom part in two strands in different colour. 2. few more shapes, I did not get the petal[last] one right though! Still waiting for some inspiration for working this stitch.